Bethesda released a new gameplay trailer for Rage 2. Called “Everything vs Me”, the trailer showcases just how dangerous the game’s post-apocalyptic open world can be. This trailer is crazy. An expected sentiment for sure (have you seen this game?). But this one seems to be extra crazy; it features Walker (the game’s protagonist) engaging in shootouts with giant mutants, wasteland samurais, military regimes, an uppity buffalo and more. 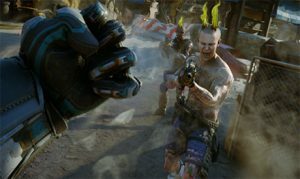 Rage 2’s May 14th launch date is rapidly approaching. So, it only makes sense for Bethesda to drop some trailers in hopes of garnering more hype. That said, outside of revealing new story details, there isn’t much more they can do. Everyone who’s looking forward to playing is already invested. I mean, what do you think? Are you ready to drive out into the wasteland or would you rather see/hear more first? Either way, we got you covered. Check out 9 minutes of nearly non-stop action in the latest Rage 2 video.